Leukemia Fighter! (CML); I Am Dancing and Traveling My Way Through: ThermaCare Wraps and Leukemia! For most of my life, I have suffered, on occasion, from a lower back issue. I never know when it is going to happen or what is going to cause it. It may be something as simple as putting on a sock, or taking a step; but when it happens, it typically means that I will be spending, at the very least, three weeks in bed. My hips go left and my shoulders go right, and I cannot even begin to stand up. Ironically, since I started dancing, these episodes have become so infrequent, that I no longer even think, or worry about them. If I were to speculate on the “why” this has happened, I would say that it is because of my strengthened core muscles, due to dancing. So, I have finally managed to escape the genetically “bad” back, but am now faced with the Sprycel, muscle cramping back. It is a totally different type of back pain, but can be just as debilitating. It seems that lack of movement, and extended rides in the car, aggravate it tremendously. Joe and I finally figured out that by building me a “throne”, consisting of a notebook, two clipboards and a knee pad, to put on his bucket seats, helped to keep me sitting in a better position, alleviating the frequency of the muscle spasms and cramps. With all of our traveling, back and forth between Idaho, Arizona and California, my back has been a mess. My oncologist gave me a prescription for Baclofen, but I have yet to be brave enough, or in enough pain to give it a try. I am so terrified of new medications that I choose “suffer” over “risk”, but I do have them in case of an extreme emergency. He also prescribed Voltaren Gel, which is utterly amazing!! That, I am using, and the difference it makes, is like night and day; Voltaren Gel is truly a God Send! Anyway, my chiropractor suggested keeping my muscles warm, during long car rides, so I purchased some ThermaCare heat wraps for our last trip south. I strapped one on, put on a preventative back brace, climbed up onto my throne, and stuffed a pillow behind my back. I must say that the heat felt AWESOME! We drove all of the way from Boise to Las Vegas, and I only had to apply the Voltaren Gel once; miraculously, I felt pretty darn good. It was not until I slipped into a nice hot bath, that I noticed burning on my lower back. Thinking that this was odd, I finished soaking, got out of the tub and asked Joe to look at my back; what he saw, were blisters, large, popped blisters. 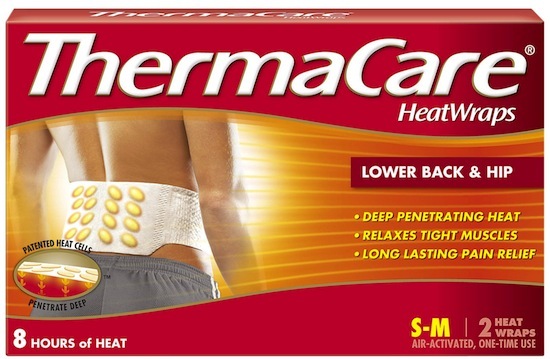 It seems that the “heat” from the ThermaCare wrap had blistered my skin. I had no idea that this was even a remote possibility. Of course, I grabbed the package and read it AFTER this had happened; and there, in black and white, it states that this product can cause burns, and if you are older than 55 you should adhere to additional specific instruction. This only added insult to injury, I now apparently have the skin, of someone that is 55 years, or older. I was totally annoyed, at myself for not taking better care in reading the instructions; despite the fact that I still would not have followed the over 55 instructions and the fact that I now had burns on my back to add to my discomfort. These burns took nearly a month to heal, and I am permanently scarred. Bummer! In ThermCare’s defense, I did preclude any serious back issues, during our entire trip, partly due to the heat and warmth of their wraps, I am sure. But I am here to warn you; if you use ThermaCare wraps and have even the slightest skin sensitivities, no matter your age, then be certain to place a thin tank top or cloth between your skin and the ThermaCare wrap. To help alleviate as many traveling obstacles as we can, in the future, Joe sold his car, with the throne and purchased a 4 wheel drive Toyota Sequoia. It will be a great vehicle for traveling in the snow, as well as a much better seat, for both of us, while driving and riding for long distances. It has built in seat and back warmers; Score! Provides heat therapy for temporary relief of minor muscular and joint aches and pains associated with overexertion, strains, sprains, and arthritis. THIS PRODUCT CAN CAUSE BURNS. I take gleevec and have muscle cramping also. My doctor gave me baclophen and it works great for my cramping. It doesn't alleviate it completely, but does make a huge difference. Thanks for the vote of confidence! Did it knock you out? Have you tried Voltaren Gel?